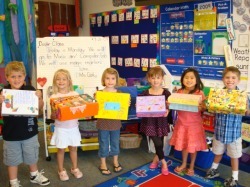 Each month, I send home a project for the whole family to do together and return to school. 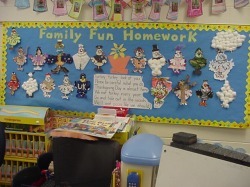 When the finished project arrives back at school, it is hung on our special Family Fun bulletin board or in the hall outside our door. 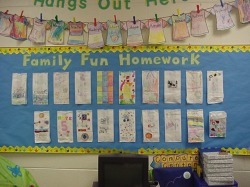 We love to share our Family Fun Homework with the rest of the school. Frog Street books, and phonics books. library for all the students to enjoy! of cereal, cookies, or crackers. The kindergartners are given turkeys to disguise over the holidays. This is one of our favorite Family Fun Activities. 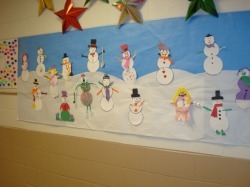 In the past, we have had Elvis, cheerleaders, hunters, a flower pot, snowmen, Santa, angels, UK players, and rock stars! Turkey, turkey, look at you! Please be careful what you do. We eat turkey every year. Go and hide out in the woods. We'll eat pizza like we should! 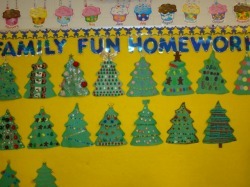 In December, each child is given a Christmas tree to decorate. We encourage them to make AB, ABC, ABB, AAB, or AABB patterns with the ornaments. It's time for Valentine's Day! 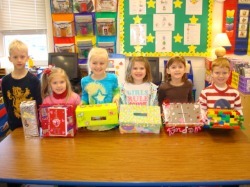 Students get to design their very own Valentine box with their family. 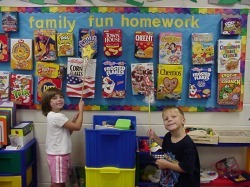 Possible ideas include decorating empty cereal boxes, candy boxes, shoe boxes, or gift boxes. We are ready for Spring! Will March come in like a lion and out like a lamb? It's time for flying kites. 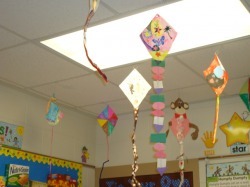 The families get to design kites. It's fun to color Easter Eggs! 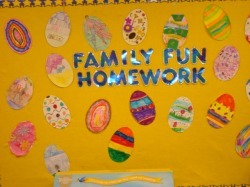 We asked the kindergartners and their families to design unique Easter Eggs for our room. Our families are so creative!